I have had the chance to purchase a wood lathe and I must say it cost me more than I could chew! It took me months to save for the lathe that I was eyeing on online but aside from the lathe itself, I had to purchase additional accessories to feed my overwhelming interest. Now I am quite happy with my lathe but I still have a lot to learn how to do this and that. But I guess I am ready to learn now that I have the best wood lathe that money can buy. I would like to help consumers like me with this review. I hope they could find the lathe that will suit their needs and their budget and to use it well. This review should also help people who have never used a lathe before but are willing to try. Wood lathes may look intimidating with all the knobs, screws and pieces that are just simply overwhelming. I am new to woodworking and have recently acquired a new lathe and I must say that this machine has not just made my work more efficient but I was able to create shapes and pieces that I never knew was possible. I used to manually cut sand and finish pieces and because of this, a small oval knob for my dresser took me half the day to finish! I even had a few mishaps and had to use new wood. With a wood lathe, I was able to finish a small knob, to perfection, in just 20 minutes. And that’s not all; I was able to make bowls and wooden legs. I plan to make more and I promise I won’t give up till I mastered this lathe. Now there are a lot of wood lathes in the market with basically similar features and design but the most important thing that a consumer would probably look at is the overall construction or design of the lathe, the price and the warranty. Don’t rely on the adage that quality has to come with a price. That won’t be the case with a wood lathe. You will find lathes with amazing features, good overall construction but has an affordable price. I recommend reading reviews too and checking out social media posts about the product to get a good first-hand information about the wood lathe before you make your purchase. Lastly, compare products to see the pros and cons and the advantage and disadvantages of each one. You have the upper hand when you choose well especially when purchasing wood lathes. The Jet JWL – 1014 wood lathe is a hardworking lathe that will not just look pretty on your workstation. It is a lathe with six spindle speeds at 500, 840, 1240, 2630 and 3975 with integrated 24-positon indexing. 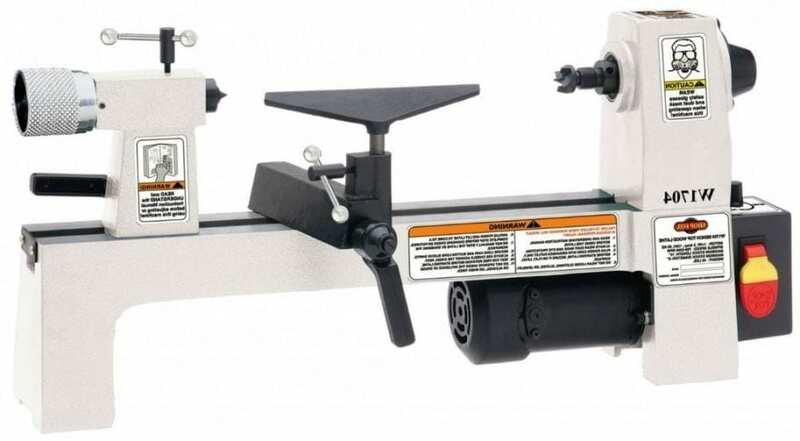 This wood lathe has improved tensioning system that will allow you to access the belt easier. This lathe has a wider belt and every woodworker knows that a wider bed is very essential to the rigidity of a lathe. The Woodtek 143009 is a machinery lathe that makes small projects easier and quicker to do. This lathe is a colorful and simple machine that has a very straightforward use. It has ample workspace that’s perfect for making small projects like knobs, chair legs and small bowls, ornaments and other small items. This lathe is small but it works like 10” midi tools for the best price. Other features to watch out for with this wood lathe are a poly V-belt drive, self-ejecting tailstock and easy side access for faster belt changes. Just some of the accessories included in your purchase: a 6” tool rest, 3 1/8” faceplate, live center, spur center, chrome hand wheel and a knockout bar. The NOVA 46300 Comet II is a mini lathe 2013 model. It is an updated version of the previous lathe model with a better speed range of 250 to 4000 RPM. It has a 12” swing over bed and a 16.5” between centers which makes it perfect for small to medium-sized projects. This wood lathe offers more than other models with a 3 step pulley system to take in low, medium or high speed ranges. Finally, it has a ¾ HP electronic motor with variable speed. This lathe can is backed with a full replacement 1-year warranty on motor and electronics plus another 2-year warranty on parts excluding motor, consumables and electronics. Wood lathes are for woodworkers who want perfection and who want to level up in their field. Because you get optimum precision with your project with a wood lathe, it pays a lot to have one in your shed. With a lathe, you can make circular shapes, spheres and a variety of curved shapes not just on wood but also on other types of materials. Top quality wood lathes can also work on other materials and substrates other than wood and will even add that classic touch in your projects. Wood lathes are for beginner woodworkers. In fact it is one of the tools and machines used in woodworking workshops and shop classes. I remember using a lathe for the first time in school and I must admit, I fell in love with it. I recommend that wood lathes such as these top models should be a part of every school shop class to train school-age kids. Wood lathes are recommended to any avid DIY follower. Lathes would make an excellent addition to any tool collection. It will be a handy machine to use to make the perfect wooden spherical shapes that you may find at home like cabinet knobs, bedpost decors, patio and deck décor and more. With this tool, you can also experiment on many more materials and certainly use it for years and years to come. It’s definitely easier to get symmetrical cuts when you use a wooden lathe. You load the workpiece and choose the tool that you want to use and then use the lathe to shape the tool symmetrically. It could take hours to come up with a perfect oval shape or any symmetrical shape when you manually shape, sand and finish. It’s the tool for cutting, sanding, knurling, drilling etc. There are a lot of things you can actually do with a wood lathe. The workpiece may be subjected to different kinds of applications: cutting, sanding, knurling, drilling, sanding and more. You may attach different tools at the tool rest and presto, your piece is done! Definitely all woodworkers that have had experience with a wood lathe know that it is faster to work with a lathe than manually manipulating a piece. It is easier to work on a piece and definitely faster when you have a secure and easy use to tool in your shop. One of the best advantages of using a wood lathe is that you reduce waste every time you do a project. Mistakes are very minimal and therefore you will reduce the cost of making your projects. Relying on a wood lathe each time you work on any project will make you more and more of an expert. You can make as many wooden parts with symmetrical sizes each time with a wood lathe. Thus a wood lathe is recommended for people who would like to work fast with the best quality all the time. Motor capacity – a powerful motor can handle any type of wood and any material. Name it: metal, plastics, acrylic and more. If you are very critical about the lathe that will work for your specific material then you must consider this feature first. If you plan to basically work on wood, take note that the are many types of wood, each with a specific level of hardness. A more powerful and durable motor will reduce stops, unnecessary jolts and pauses that could affect the outcome of your workpiece. Larger and wider bed – a larger and wider bed means that a tool is likely to be stable and rigid. You can work with larger and more intricate materials as well. There are many lathe models so be very particular about the lathe dimensions above anything else. Variable speeds – a variable speed motor will let you work with utmost precision. You can work with table legs, small wooden columns with varying symmetrical designs and other wooden ornaments for decks, stairways, furniture and more. Variable speeds will also let you work not just with wood but with other softer or harder materials, anything goes. Easy access for tool change and cleanup – definitely this is a plus. You must have easy, open access to your tool bed on both sides of the lathe so you can change tools easier and faster plus you can clean the lathe easier and faster too when you have easy, open access. To think that there numerous tools and attachments that you can connect to this wood lathe! It pays that you have easy access to make the appropriate changes that you want to make for your project. Robust construction and lathe body – you must consider a wood lathe with a robust body and you can tell this by looking at the overall construction of the machine. Check the tool rest and inspect how efficiently it could hold the attachment or tool you want to use. Check the machine from the tailstock to the motor and take note of any wobbling, unnecessary movement and vibrations. If you can, take the tool for a test and see how efficient it could work with several different materials. This is crucial since you will never know how it could work well with your project and workpiece if you have never seen the lathe in action. Read reviews too and find out what other people say about the wood lathe and pay close attention to the overall construction and durability of the lathe. Machine accessories – most lathes come with complete accessories while some lack the tool or part that you want to specifically use for your project. The most common materials included are tool rests, live center, spur center, rubber feet and wrenches. You might also find extra belts and of course the lathe manual in some products. Getting a lot of extras mean that you don’t have to spend more once you get your lathe. This was what happened to me; I failed to check on the components included with the lathe that I purchased that I ended up getting additional accessories online. It cost me more but I would never take back the lathe that I chose. Price – the price definitely makes a huge difference when buying a wood lathe. Take note that as lathes vary in features, these also vary widely in price. But take note that not all expensive lathes are amazing. Some really good products may cost just a fraction of a very expensive brand. Sometimes it really pays to read reviews and to check out product comparisons to really find the best quality product which is perfect for your particular project. Warranty – the product warranty is definitely something that should be placed on top priority. Warranties will protect you from any repairs, faulty parts and any untoward circumstances that will only affect your project and work. Some lathes have 2 to 3 years warranty while there are brands which carry up to 5 years warranty. Look for the product that will work for your particular project or job; you may otherwise get additional warranty for your wood lathe from the store you purchased it from. The Jet JWL – 1014 wood lathe is a lathe that has a compact yet sturdy design. It may be used in a shop at home, in school or at the worksite. It has six spindle speeds at 500, 840, 1240, 2630 and 3975 with integrated 24-positon indexing. This wood lathe has an efficient tensioning system to let you access the belt easier. It has a wider belt which shows how rigid and how efficient the tool is to use for many applications. This lathe is one of the most straightforward wood lathes in the market because it has a very compact design. No frills or unnecessary parts that will only make operation complicated. You won’t find parts that don’t have a purpose and even sections that give off unnecessary movements and vibrations. What you see is what you get with this compact an efficient machine. Six-spindle speeds make it easier to create different precise and perfect projects. You will be able to do all kinds of projects especially those that require very intricate symmetrical shapes and curves. Choose the speed that you need for your particular material and watch it transform from a raw workpiece to a perfectly precise project with the use of this Jet wood lathe. Definitely you can create more projects and even tackle very intricate designs when you have 24-position indexing. This makes the Jet JWL 1015 far better than other brands that will only provide you with limited points. And with more indexing points, you can load larger and more complicated workpieces and work on almost any kind of material with this Jet wood lathe. A wider belt will less likely loosen and affect the performance of the lathe. You will never have to worry about pauses, jolts and unexpected stops when you use this efficient woodworking lathe for all your projects. This is the feature that really won me over. A lathe with a 5-year warranty is very unlikely and will therefore protect you from repairs, broken parts and all uncalled for circumstances as you use this wood lathe on a regular basis. If you are looking for a lathe that will work well and has a better warranty then this product could be the one you are looking for. The Woodtek 143009 is a machinery designed for small to medium-sized projects. This lathe a simple machine with a straightforward use. It is small but surprisingly has a sufficient workspace ideal for making small projects like pens, knobs, chair legs and small bowls, ornaments and more. This lathe works like 10” midi woodworking and the for the best price. Other features that you should check out are the poly V-belt drive, self-ejecting tailstock and easy side access for faster belt changes. Some of the accessories included in your purchase: a 6” tool rest, 3 1/8” faceplate, live center, spur center, chrome hand wheel and a knockout bar. This could be the first thing that you will notice when you see a Woodtek 143009 wood lathe. It is compact and looks like you can take it almost anywhere you want to go. It looks easy to use and it actually is. You just load the workpiece and you are on the go. You won’t have to worry about tool or attachment changes too. The components that come with this lathe are very easy to install and use and there is no need to use complicated tools to install your attachment as well. And with its compact design, you can actually take this tool anywhere you want to go and use it efficiently almost anywhere as well. This unique V-belt design reduces belt fatigue and getting off at the most inconvenient time. No one likes a loose belt and even a broken one and with this cool belt you will never be rudely interrupted as you form, finish, sand and turn your workpieces with ease. A truly awesome feature that will amaze you and is not found in all lathes. You will be able to work smoothly as you simply load and unload pieces without any worries of stalling or getting stuck after you are done with a piece. A great feature that may not be too important for some woodworkers but a great one to mention. Both sides of the machine are open and free and therefore you can access the bed without any worries. You can make tool or attachment changes easily and you can clean your bed faster and more efficiently too when you got quick and easy access on either side. All the important accessories and basic attachments that you use for your woodworking jobs are available when you purchase this wood lathe. You will never have to buy additional tools if you plan to create basic projects however, as you progress and find more complicated jobs you will soon understand the need of buying new and more tools. However, the basic tools and attachments that come with the initial purchase of the product will be able to master the use of the lathe and prepare you with more complicated jobs in the future. 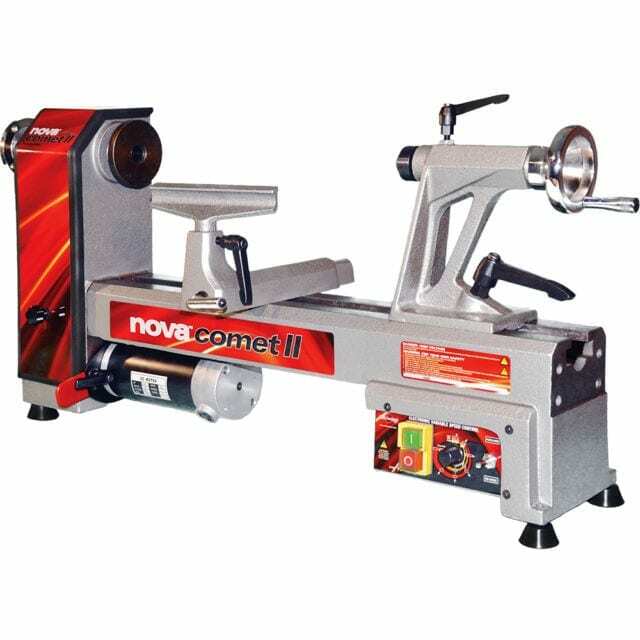 The NOVA 46300 Comet II is a mini lathe and was released in 2013. This is an updated version and boasts of better speed range of 250 to 4000 RPM. It has a 12” swing over bed and a 16.5” between centers for small to medium-sized projects. This wood lathe has a 3 step pulley system to take in low, medium or high speed ranges. It has a ¾ HP electronic motor with variable speed. This updated NOVA wood lathe comes with a full replacement 1-year warranty on motor and electronics and another 2-year warranty on parts excluding motor, electronics and consumables. This NOVA wood lathe is small enough to fit in any working space and will surely be a good match for your work space in your shop or in your garage. It has an updated design and is a compact and efficient design compared to previous NOVA wood lathe design. You will surely appreciate how tall it is with the belt drive hidden from view and can be easily accessed from the housing near the motor. 250 to 4000 RPM is one of the best speeds in the market which means it can work fast and more efficiently as well. You won’t have to worry about irritating stops and pauses that will affect the overall outcome of your project. Faster speeds will allow you to use this lathe for all kinds of materials. And when precision and speed combine, you get a totally reliable machine such as the NOVA 46300 Comet II. A larger distance between centers will make it easier to use larger workpieces than a narrow one. With a large space, you can pretty much use any kind of tool or attachment and thus you can make anything out of this lathe. But for safety, use only attachments or tools that are compatible with the NOVA 46300 Comet II wood lathe. An optional bed extension will expand this to 41”. This NOVA lathe boasts of a much-improved motor compared to its predecessor. You will that the Comet II is more powerful ¾ HP electronic variable speed motor; this means that this lathe will never pause, jolt or have irregular bursts of power that could affect the outcome of your project. You will be able to work seamlessly and will have more control over your piece when you use this updated NOVA wood lathe. The SHOP FOX W1704 is a tough wood working benchtop lathe that has a powerful motor at 1/3 HP, 2 Amp, 110V single-phase, 60Hz. This lathe looks very compact and easy to use, no frills and no fuss. It has a full feet of distance between centers which allows you more room to work on your project. This lathe has an 8-inch swing over bed and even has an extra tool rest. You will love that this lathe won’t vibrate no matter how hard your project is because the stand is made of cast iron. This SHOP FOX lathe has variable speed control so this means you will have more control over your workpiece at all times. The SHOP FOX W1704 1/3 HP Benchtop Lathe is one of the simplest lathes to use with a powerful motor that will let you work on any kind of project for the least amount of time. You will be able to create pieces that you have never thought possible and do this is quickly; you can finish a table, chair or even a flight of stairs in just a day with the SHOP FOX W1704’s powerful motor. The 12” distance is perfect for working on larger projects which will surely let you move more efficiently. You will also be able to use more types of tools considering this large area to work with. This large swing over bed will also let you tackle larger projects and take on more complicated shapes and curves. You will surely spend more time working on intricate projects and challenge yourself more when you got this large swing over bed. This power tool is heavy but it sure beats having to deal with vibrations that will only affect the overall outcome of your project. The cast iron body will also hold no matter how long you have to work and how intricate your pieces will be. And because it is compact and durable, you will surely get more use out of this tool than any other woodworking tool in your shed or shop. This is a good lathe to use especially when you need precision with your projects. Its variable control switch will let you take control over your projects better. You can now adjust the speed of your motor according to the type of material that you will use and of course according to how sensitive or delicate your project is. The switch is easy to locate and thus will be easier to power on and off the machine, fast. Who would think of two tool rests? The NOVA wood lathe would! 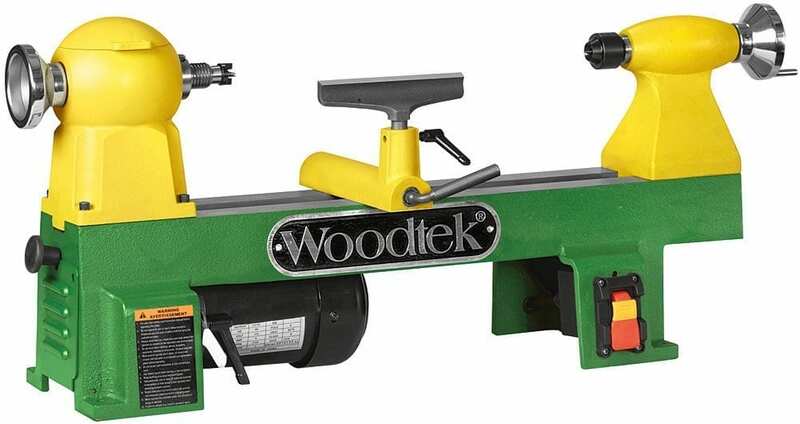 This wood lathe comes with two tool rests for two of your most-frequently used tools. And of course if ever you lose one, you will surely have a spare. The RIKON Power Tools 70-105 is a power wood lathe that will surely get the job done. It has an efficient ½ HP motor that will provide ample power for all your tuning, shaping, sanding and cutting needs. It is a heavy and compact lathe so you will have a durable tool to use that won’t vibrate unnecessarily. And since it has a compact design, it won’t take up too much space in your garage, shop or working area. This lathe has precise bed and matching components. Precision begets precision and this is surely what you want in your project. The RIKON Power Tools 70-105 is one of the most powerful with its heavy-duty motor that will let you cut, shape, sand and tune any type of wood, material or substrate. You will get utmost precision all the time and of course a powerful motor means there will be no pauses, unnecessary movements and vibrations that will only affect the outcome of your work. This lathe is made to last with its heavy cast iron body, legs and attachments. You will be able to work quietly and with the least amount of vibration when you have as sturdy and durable tool as this lathe. And because it is made almost entirely out of cast iron, the main problem would be it is too heavy to move around. But think about this, this lathe will provide you with hours of perfect use because of its strong body. You need a wood lathe that will be as durable, robust and indestructible as this model. There is no doubt that this lathe has very precise parts. Just check out an unboxing video featured in YouTube with the user initially checking for precision and alignment before he used the lathe. And because of precise tool parts, you will surely have no problem getting precision and perfect results no matter what type of project you want to do. The first thing that you will notice when you see this RIKON lathe is that this looks like large lathes used in industries and factories and this is because it is. It is a scaled-down design but the only differences are the weight and the dimensions of the machine. Basically all the features and the pros of this lathe is similar to an industrial counterpart. This means that you can expect tough and dependable performance in your shop or at the construction site with the RIKON Power Tools 70-105. Vibrations only lead to poor outcomes and may even affect the overall performance of the workpiece. If you are making a workpiece as a table leg then expect a poor table leg that could cause accidents. This lathe reduces vibrations because of its heavy duty cast iron body. It is also well-built with no moving parts; you will definitely be able to make good quality workpieces when you use this durable and vibration-less lathe. The ability to adjust the lathe speed is a plus. This is because you can make precision pieces and work with all kinds of materials other than wood. Remember that there are so many kinds of materials that you can use; you can use metal, plastics, acrylic and more. You need a lathe with a variable speed setting so you can make adjustments accordingly. 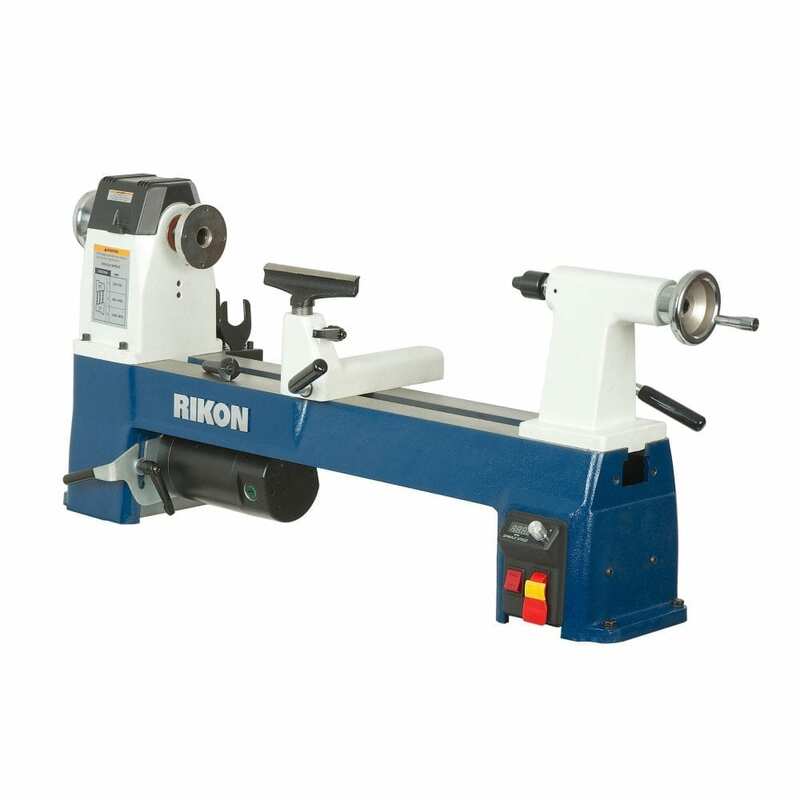 The RIKON wood lathe comes with basic accessories such as a tool rest, live center, spur center, wrenches, rubber feet and its handy lathe manual. You will actually save money as you don’t have to purchase accessories on your first try. There are some complaints saying that it is hard to find accessories for this wood lathe and therefore having all the basic accessories that you will need will surely be a breath of fresh air. There are a number of social media posts and forums about help for getting the best wood working lathe for a particular project and most consumers agree that the Jet JWL 1050 is the most efficient and the most preferred wood working lathe model. The main reason for their choice was the lathe’s compact and robust design as well as the tool’s non-complicated looks. Not all woodworkers use lathes due to the fact that most of these only complicate their work but with the JET lathe, it is easier and far faster to make different symmetrical pieces like pens, table legs, oval shapes, bowls and different home ornaments. There are also a few negative reviews about this lathe but were mostly about how to get additional parts and attachments. These are not really related to the actual tool but should still be considered especially when you want to add more attachments and tools for this lathe. Runners up Woodtek and NOVA were not really that far behind. The main reasons why these lathes were not up to par with the Jet was that these cost more plus had shorter warranty periods. All in all, these wood lathes were still good for beginners as well as seasoned woodworkers. Social media is a good tool to find out more about a product especially woodworking tools like wood lathes. You will be able to make a sound shopping decision when you use reviews and forums as one of your buying guides. The first five choices for the top wood lathes may not be up to par to you or you might be looking for something else. Don’t worry about not being able to make a decision right away; here are three more woodworking lathes that you might find interesting. The Proxxon 37020 is a micro woodturning table that will allow you to make pens, small pegs and small symmetrical items. You will find this handy for creating toys and small décor and will be a perfect addition to any woodworking shop or garage. This lathe comes with 6 collets sizes 5/64, 1/8, 5/32, 15/64 and 5/16 inch (2, 3, 4, 6, 8 and 10 millimeter). It has a small and quiet motor which is top quality and thus can last for more and more projects to come. It also has an adjustable tool rest, aluminum cast bed, a tailstock with a live center and other efficient features that you will find handy. The Rikon 70 – 500-inch woodfast lathe has an electronic variable speed/digital readout motor with 5 speed ranges that provide speeds of 50 RPM to 3890 RPM for all your woodworking needs. This has a reversible motor that will let you tune bowls up to 27 inches more efficiently than using other regular lathes. It has a 5-position quick connect switch box. This lathe has a built in heavy-duty stand that will let you use this anywhere. It is durable, very stable and thus there won’t be any unnecessary vibrations when you use it. Of all the wood lathes in the market, the Jet WL1015 woodworking table has certainly proven that it is not just a quality tool but also a tool that will work closely with any other material and any size of workpieces. This Jet wood lathe is one of the most efficient and compact. This is what I liked most about this lathe because it has a compact and seamless design. There are no parts that will move unnecessarily and will never be in the way as you make symmetrical precision parts and pieces each time. This reduces the worries of dealing with early repairs and early part breakdown. And if you plan to use this tool for more and more projects you will surely find this warranty a good value to have. And aside from all these great features, the Jet JWL – 1015 has a very efficient design which will let you take it anywhere, at the shop or to your workplace. It weighs far less than other wood lathes plus it is also easier to carry than other lathes. Overall, this makes this JET wood lathe a good choice above all other lathes of the same size, features and design. I recommend the Jet JWL – 1015 for any beginner woodworker and also for professional woodworkers as well. You will surely improve your woodworking hobby or job when you have this kind of handy power lathe around. 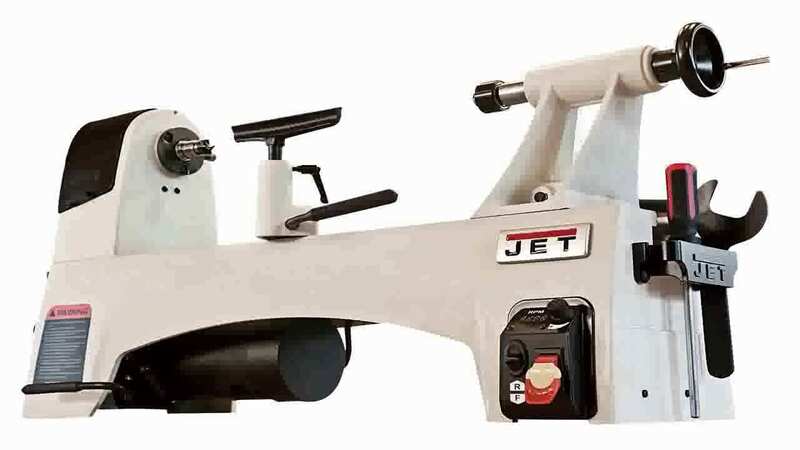 If you are interested in the Jet JWL – 1015 wood working lathe, click here to start your purchase. The remaining other woodworking lathes are still worthwhile choices however, these may not be as affordable as the Jet JWL – 1015. Remember, take your time and to read reviews so you can get the best quality for your money.